Bundles are complimentary products that are being sold together at a discounted rate. By buying the bundle you are getting a collection of items at a lower cos than you could purchase the items individually. Pick your Bundle to save by clicking the Select Item button. 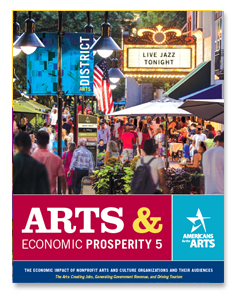 This complete set of Arts & Economic Prosperity 5 materials contains everything you’ll need for your organization and its stakeholders. With ample summaries, slide rules and brochures to pass on to others, you’ll have the necessary information for Board Meetings, community presentations, and other advocacy opportunities. Bundle includes: 10 Report summaries, 5 Slide rules and 100 Report brochures. Set includes: 10 Report summaries, 5 Slide rules and 100 Report brochures.